Sometimes people just don't get along. Envy and dislike will lead a person to do something they might not normally do, and with motives that are less than pure the results are less than pure. J. Jonah Jameson has both an envy and dislike of Spider-Man, and this has led the publisher to make decisions that put himself and his family at risk, not to mention innocent people, just to get at Spider-Man. One of these decisions led to the creation of the super-villain Scorpion. MacDonald Gargan didn't start out as a bad guy. He was a private investigator hired by J. Jonah Jameson to track Peter Parker and see how he got all his Spider-Man pictures when other photographers were having so much trouble. Before Gargan was able to finish this job, Jameson had another for him. He wanted Gargan to undergo some experiments to get superhuman powers from a scientist who had developed a way to mutagenically imbue animals with unusual traits. Jameson paid the then princely sum of $10k (back in the 60's you could buy two Corvettes for this much money and still have some left over for the new Stones album) to both Gargan and the scientist to make it happen. And it did, because the experiment was successful and Gargan had superhuman abilities like strength, stamina and agility. Just being strong and fast isn't enough in the Marvel Universe to stand out, so to make sure he looked good on picture day, Gargan got a cybernetically enhanced suit (later it was discovered it was made by the Tinkerer) that was steel mesh and had a huge, articulated mechanical tail. Taking on the title of Scorpion, Gargan was ready to fight Spider-Man and defeat him. One of the side effects of the treatments (besides irritated bowel syndrome) was a slight tendency to become psychotic and to lose any concept of right and wrong. The combination of super powers, a costume and psychosis is a sure recipe for being a super-criminal, and after a failed attempt to deliver an antidote to the treatment, the Scorpion turned to crime. The bad part about being a criminal in New York City is that Spider-Man is around to stop you. And over the years Spider-Man made a habit of stopping the Scorpion when he would rear his head. If Spidey wasn't around, he would usually get stopped by someone else, even when he had help as a member of the Masters of Evil and while working with Mr. Hyde. In addition to his animosity towards Spider-Man, he also has a thing for Jameson, even going as far as kidnapping his son and wife. Just like the German rock group he keeps coming back and getting hits, too bad that's about all he has similar to the group. Achtung, baby! 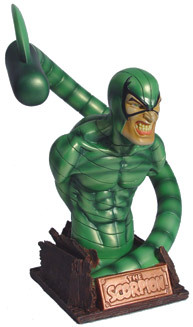 The Scorpion was created by the dynamic due of Spider-Man, Steve Ditko and Stan Lee. They also created a few other characters you might have heard of, like the Green Goblin, Doctor Octopus, the Vulture and, oh yeah, Spider-Man. 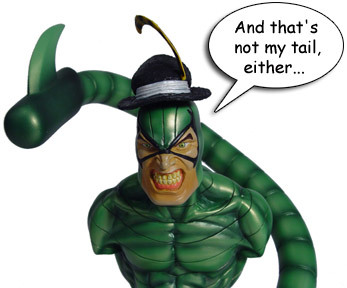 The Scorpion's colorful costume and his status as a villain was enough to get him into the Rogue's Gallery line of busts from Diamond Select Toys. Being one of Spidey's regular foes doesn't hurt, as so far all the characters in the line have been nemeses of the wall-crawler, though that will be changing soon. The line kicked off with the Lizard, then moved to the Sandman, Carnage, Kingpin, Kraven and The Vulture. Next in the series is Venom, and after that the line will cover a few non-arachnid foes with Sunfire and the Mandarin. More busts are planned after these two, but they have not been announced yet. The Rogue's Gallery is collaboration between Diamond Select Toys and Art Asylum. Art Asylum does the design and sculpting work while Diamond Select handles production, distribution and licensing, and the result is an impressive body of work. The design aesthetic for the Rogue's Gallery is to create busts that are waist up, with no arms and sculpted in action poses. The size of the busts is larger than those released by Bowen Designs and smaller than those done by Dynamic Forces. The Scorpion is in a fairly static pose, though the sneer on his face shows he's up to no good. The bust is painted with a mint metallic green color that screams Pontiac, and is usually reserved for cars from the 60's. The man is busting through a wood floor, and he has a handy nameplate in case you forget his name. A small, but subtle touch is using the same font that was used on the cover of Amazing Spider-Man #20, his first appearance and origin issue, for the Scorpion's name. The eye-catcher is the tail, though. The Scorpion's tail is seven feet long and it is well represented in the bust, with it coming up from the front and then looping around the figure ready to either strike or to fire a force blast. The way the tail encircles body and is suspended in air is the distinguishing feature for this bust, and you'll have to give the man a little room on your display shelf. 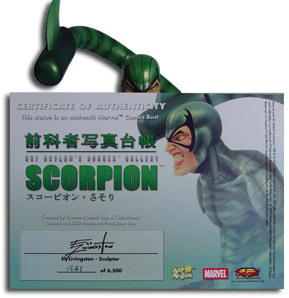 The Scorpion's sculpt was created by Ken Usanami, and he was assisted by Eli Livingston. The two worked together on the Marvel Milestones Thanos statue, and Eli's other work on the Rogue's Gallery includes the Vulture and the upcoming Sunfire and Mandarin. The bust comes complete with a full-color (as opposed to partial color) certificate of authenticity, with Eli Livingston' signature on it. The certificate is also numbered and is only one of 6500, matching the number of busts created for this piece. That is also half the amount of pre-formed Styrofoam used to package the bust. The box design for the Rogue's Gallery is a simple white box with images on it, and this contrasts the generally black nature of the subjects inside. 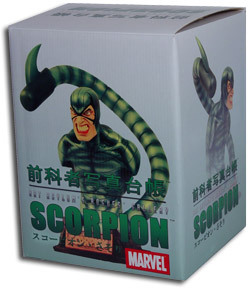 Where to buy the Scorpion Bust: This piece is limited to a run of 6500, and you can find it at your local comics shop and various online retailers such as TowerRecords.com for between $35 and $45 USD.